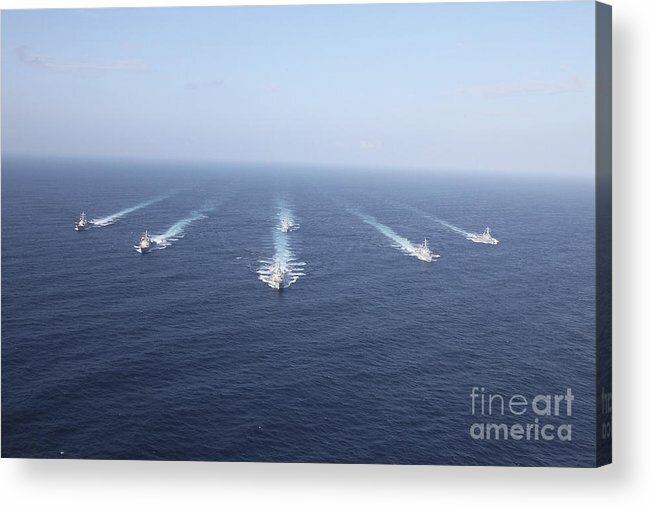 Military Ships Transit The Philippine by Stocktrek Images - 10.000" x 6.625"
Military Ships Transit The Philippine acrylic print by Stocktrek Images. Bring your artwork to life with the stylish lines and added depth of an acrylic print. Your image gets printed directly onto the back of a 1/4" thick sheet of clear acrylic. The high gloss of the acrylic sheet complements the rich colors of any image to produce stunning results. Two different mounting options are available, see below. 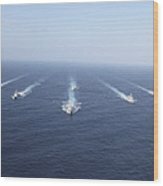 There are no comments for Military Ships Transit The Philippine. Click here to post the first comment. 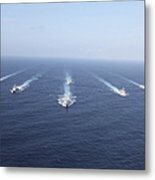 Philippine Sea, January 29, 2012 - Six of the seven ships assigned to Destroyer Squadron 15 transit in formation during Multi-Sail 2012. Multi-Sail is a semi-annual event designed to improve readiness and coordination across multiple warfare areas. 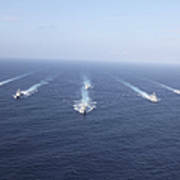 Pictured are the guided-missile destroyers USS Mustin, USS John S. McCain, USS Curtis Wilbur, USS Fitzgerald, USS Lassen and USS Stethem.